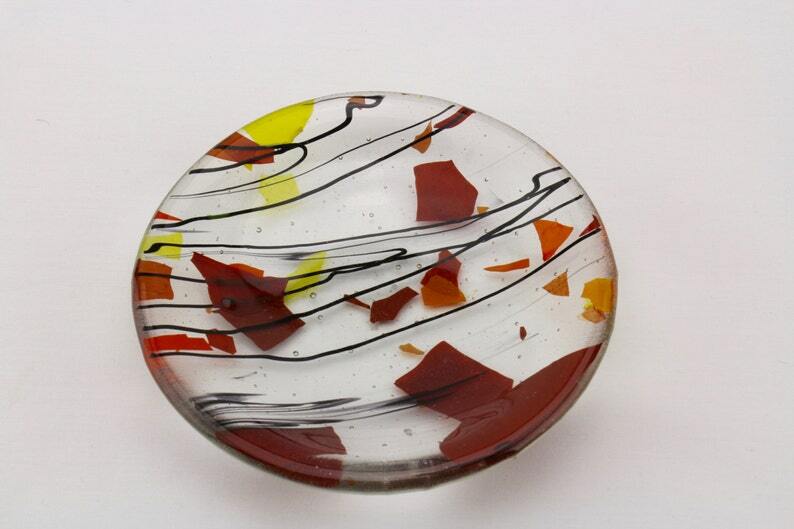 This glass dish measures approximately 5" in diameter x 1" high. The clear glass has accent colors of brown, orange, yellow, and red, with ribbons of black glass. It is the perfect addition to your fall decorations. In the living room, it can be your tea light or other small candle holder, candy dish, or trinket dish. Place it by your kitchen sink to hold your rings or sponges. Good on your countertop as a spoon rest or tea bag holder. It can be the home for your earrings or rings in the bathroom or on your nightstand. A few small marbles or stones placed on it will help keep your bar of soap from becoming a soggy mess. It will make a wonderful birthday, wedding, housewarming, Mother's Day, Valentine's Day, or "just because" gift. Food safe. Not suitable for the oven or microwave. Hand washing is recommended. This listing is to purchase one of the three 5" round dishes pictured above. The candle is not included in the purchase. Perfect little autumn candy dish. Thank you.